As the US investigation into Halkbank's alleged help to Iran in evading US sanctions continues, our base case remains it will receive a painful but ultimately manageable fine. We do not see it is to anyone’s advantage to elevate this bank-specific issue to a more general inter-state dispute between the US and Turkey, which is what would happen if the US set any future fine at punitive levels. Nor do we see broader fall-out across Turkey’s financial sector, as its other major banks have done very little business with Iran. We are not alone in this assessment: S&P came to much the same conclusion in its recent report on Turkey. With US sanctions policy becoming more hawkish, we see little chance of investor concern dissipating soon. Halkbank reported robust 1Q18 net profit of TRY790m, a little behind expectations but up 10.5% quarter on quarter (down 35.2% YoY). While interest income increased 33.9% YoY to TRY 6.9bn on loan growth that outpaced the rest of the sector, interest expenses rose a tremendous 71.5% YoY to TRY 5.0bn, leaving NII 13.7% down on the year. 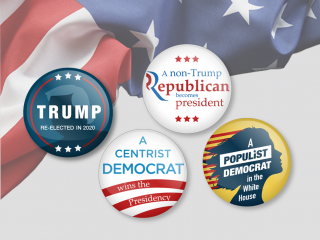 Headline asset quality improved modestly. Provisions declined 1.6% YoY to TRY 463mn, allowing the cost of risk to fall from 113bps in 1Q17 to 76bps in 1Q18 (4Q17: 81bps). 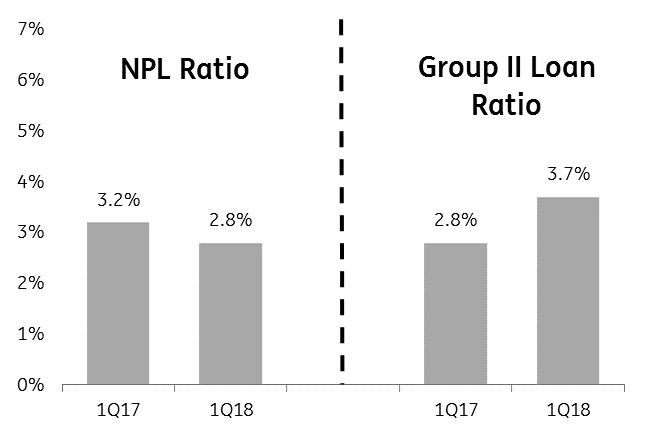 While the NPL ratio ticked down to 2.8%, just below the sector average, Group II loans increased by 1.2ppts QoQ to 3.7% of loans (though this was a smaller rise that we saw in the more corporate-facing large private banks). 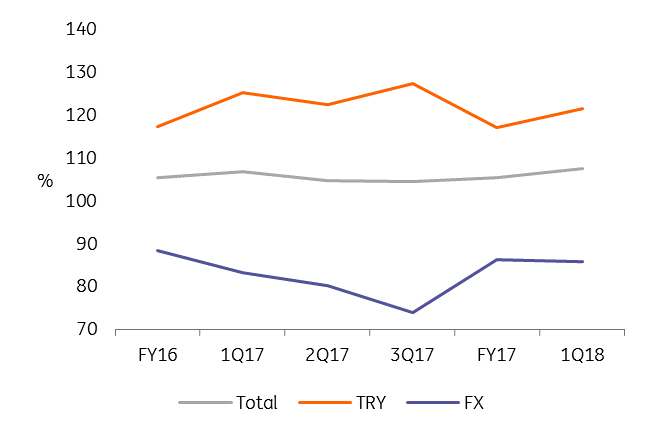 Like other banks, Halkbank has increased Commercial and SME loans under the CGF, so we expect asset quality to decline somewhat as these loans mature. We note, though, that Halkbank has been less aggressive than peers in FX lending. In terms of funding, the headline Loans/Deposits ratio (including interbank deposits) has deteriorated modestly to 108%, much better than the sector average of 124%. Moreover, as we have seen elsewhere, the stress is appearing in the TRY ratio (122%, down 4ppts YoY) vs the FX ratio (86%, up 3ppts YoY). Halkbank actually fares better in terms of the TRY L/D ratio than most of its competitors. The Tier 1 ratio is relatively decent at 12.0%, down 60bp QoQ on TRY depreciation and loan growth, although total CAR is weaker than peers’ at 13.4%. It Is hard to see Halkbank raising T2 capital in the absence of a solution to its US issues, and organic capital generation is not the strongest in the current environment (+37bp in 1Q), so it needs a reversal in TRY’s fortunes to prevent the headline T1 ratio from declining to more concerning levels. While we think it is fine for now, we would not want to see it slip below 11% once YKBNK has completed its rights issue to avoid it looking relatively weak compared to peers. Halkbank’s 1Q18 net profit fell 35.2% YoY to TRY790m, although this represented a 10.5% increase QoQ. The annual decline was caused by a 13.7% drop in net interest income to TRY2.0bn as higher interest expenses (+71.5% YoY) offset the 33.9% rise in interest income (itself driven by strong loan growth of 27.9% YoY), causing NIM to fall 1.6ppts YoY to 3.1%. Net interest income makes up 75% of Halkbank’s total operating revenues. Fees & Commissions, which account for 15% of revenues, also fell 24.4% YoY to TRY406m. And while operating expenses are relatively well controlled, with expenses/assets falling 10bps to 1.6% over the period, the absolute rise in expenses of 17.3% YoY to TRY1.2bn coupled with lower revenues caused the cost/income ratio to increase from 33.6% to 45.2% over the period. Halkbank’s provisioning charge of TRY463m fell 1.6% YoY. This equates to a total cost of risk of 76bps, down from 113bps in 1Q17. The net cost of risk fell to just 17bp due to significant provision reversals in Q1 (TRY188m). Commercial and SME loans posted the highest cost of risk (110bp and 98bp respectively), while the retail and corporate books were much stronger, costing just 18bp and 12bp. Bringing all this together, Halkbank achieved ROA of 1.0% in 1Q18, down from 2.1% a year ago. It was a similar story for ROE, which fell from 22.4% to 12.4% during the course of the year. Halkbank’s TRY215bn loan book is of decent quality. The headline NPL ratio of 2.8% has improved 40bp over the past year and is just inside the sector average of 2.9%. Interestingly, Halkbank’s loan quality across sectors is the opposite of that for many of its competitors: the NPL ratio for SMEs is 3.4%, boosted by the Co-Operative Loan Book and well below sector average (4.7%), while the bank’s Corporate & Commercial book’s NPL ratio of 2.8% is considerably weaker than the sector’s (1.9%). Halkbank also outperforms in consumer lending but is weaker in Credit Cards. As we have seen elsewhere, Halkbank experienced an increase in Group II loans from 2.5% to 3.7% following the introduction of IFRS 9. 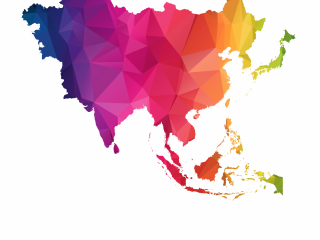 However, this number is considerably stronger than those posted by larger privately-owned peers, which have been exposed to some big-ticket corporate loans that require attention. As more of an SME/Commercial lender, Halkbank is less exposed to large corporates. Halkbank boasts a healthy coverage ratio of 109%, of which specific provisions account for 79.5%. 31% of Halkbank’s loan book is denominated in FX. The vast majority of these exposures are in the Corporate & Commercial segment, which gives us some comfort (5.3% in SMEs). These exposures are offset by a deposit base of which 39% is denominated in FX. Halkbank has a solid liquidity profile. 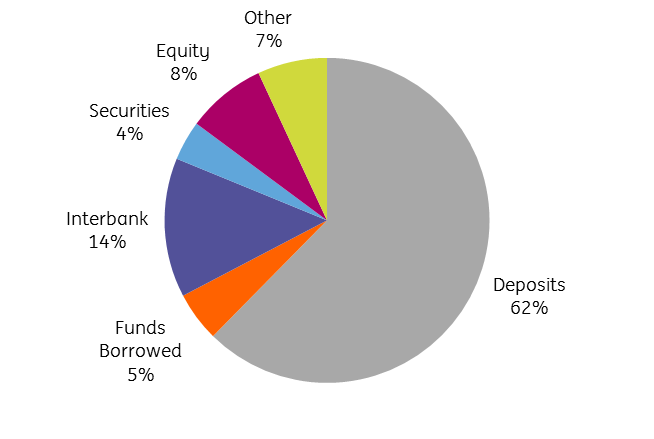 Deposits make up 63% of liabilities, with borrowings comprising another 5% and marketable securities a further 4%. FX wholesale funding makes up 10.8% of total liabilities, compared to the sector average of 23.3%. The loans/deposits ratio of 108% represents a 1.9ppt deterioration YoY but is far better than the sector average of 124%. As with its peers, Halkbank is long FX liquidity (85.9%) and short TRY (121.4%). 1Q showed a sharp spike in the latter ratio from 117% in 4Q18 as demand for FX loans remained weak. However, it is still stronger than the 125% recorded in 1Q17. Note that interbank funding has jumped from 9.5% to 13.6% of liabilities over the past year, indicating HALKBK’s growing reliance on short-term funding. Halkbank has a solid capital position. The bank posted a capital adequacy ratio of 13.4% and a Tier 1 ratio of 12.0%, down from 14.2% and 12.6% respectively in 4Q17. The main drivers were TRY depreciation (-64bp) and loan growth (-29bp), which offset organic capital generation (+37bp). Halkbank has had a lower total capital ratio than its peers for some time now due to its inability to issue sub debt, a situation that is only likely to change once its issues with the US have been resolved. The decline in the Tier 1 ratio, while perfectly manageable for now, needs to be watched. Once YKBNK completes its rights issue, Halkbank will not be able to afford many quarters of 60bp capital depletion before it starts to look weaker than peers. A period of stability for the TRY would be enormously helpful for the bank in this respect.